The A1CNow device is the easiest and most accurate way for those of us who have diabetes to check our key blood glucose level at home. But it still has spotty availability. Chex Diagnostics, formerly known at Polymer Technology Systems, started shipping it six months ago after the company had purchased the A1CNow business from Bayer Diabetes Care last year. But many pharmacies don't have it yet. The good news, however, is that we can get it for less than ever before. The pharmacist at the local Kroger supermarket told me today that he had never heard of a way to check our A1C at home. A pharmacist at the most upscale pharmacy near me remembered that they had sold the A1C test when Bayer made it but didn't have any record of the Chex Diagnostics or Polymer Systems Technology device. I couldn't find it on the Rite Aid, Target, or Costco websites. 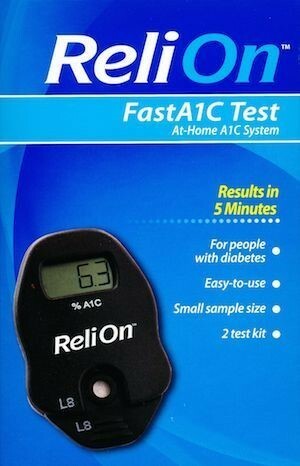 You can get the two tests in the Walgreens At Home A1C Kit for $32.99, according to the company website. At least I think that's the price, because much of the "overview" information is wrong. Besides describing what is obviously a blood glucose meter, it refers to a "lover limit of the A1C target. " Don't you love it! The situation at Wal-Mart stores is much better, although its website hasn't caught up. It's not yet on the Wal-Mart website, which shows the Bayer version at $29.88 but as no longer available. But Wal-Mart stores started getting their ReliOn Fast A1C Test kits from Chex Diagnostics about two weeks ago, Chex's Director of Marketing Laura Wilkerson told me. I found it at my nearby Wal-Mart, and my correspondent Dave Persinger found it a a Wal-Mart in California. Special thanks to Dave for being the first person to bring this source to my attention. Dave and I each paid only $22.88 for a kit of two tests. And at least here in Colorado I didn't have to pay any sales tax on top of that. I think this is a great deal for all of us who want to manage our diabetes most effectively. A1c tests first became available about 1978, but we didn't how important they were until the Diabetes Control and Complications Trial (DCCT) finished in 1993. Until then no one knew the direct relationship between blood sugar and diabetic complications. The DCCT was a major clinical study of 1,414 volunteers conducted from 1983 to 1993 and funded by the U.S. government. The study showed that keeping blood sugar levels as close to normal as possible can slow and perhaps stop the onset and progression of the eye, kidney, and nerve damage caused by diabetes. The device that Chex Diagnostics makes and sells as the A1CNow and under the proprietary names that Wal-Mart and Walgreens use is the only home testing device that the National Hemoglobin Standardization Program, or NGSP, certifies as being compatible to those reported in the DCCT. Nowadays, most everyone recommends that those of us who have diabetes get our A1C levels checked every six months. But I make sure to check mine on the first day of every month, and I always use one of these home testing devices for the great convenience they offer. Two often? My primary care physician hinted during my most recent visit that he thought I was a bit obsessive. However, my level jumped from 5.3 to 5.6 in a 31-day period earlier this year. I may have been suffering from an infection, and the early warning prompted me to take immediate action. The A1C test measures our average blood sugar level during the previous three months or so. That's generally all that most resources will say about it, so most people would not expect such a big change as I experienced in a one-month period. But this is an oversimplified understanding of the A1C. Half of the A1C level depends on the previous month, according to the definitive reference for clinical chemistry, Tietz Textbook of Clinical Chemistry and Molecular Diagnostics, 5th Edition, page 1442. Days 30 to 60 determine one-fourth and days 60 to 120 determine the other fourth. I made sure to order this book through inter-library loan rather than buying my own copy, because the best price I could find for it was $243.19. You may or may not want to check your A1C level as often as I do. But in any case I don't think that you can do any better than to use an A1CNow device with whatever name it has on it.